We currently have the most 1938 Goudey Heads-Up cards that we have ever had in stock, including two #274 Joe DiMaggio cards. In 1938, the Goudey Gum Company was starting to wind down its production of cards. They would produce only one more set in 1941. The 1938 set had some of the most unusual artwork ever produced on a baseball card. A realistic looking head was placed on a cartoon body and then, for the second series only, some tiny cartoons and phrases were written in the background. The Goudey Gum Company decided to release these cards as a secondary set to the popular 1933 set. They would release two cards for all 24 players and number the cards 241-288. This numbering system meant that there would be two rookie cards for several players, including Bob Feller. 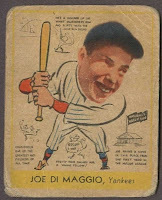 Other stars in this set include Joe DiMaggio, Hank Greenberg, and Jimmie Foxx. 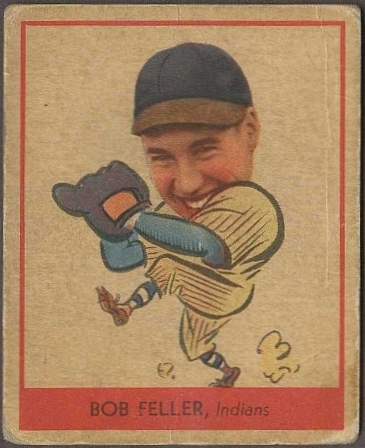 Please click here to see our entire collection of 1938 Goudey Heads-Up baseball cards. To see the reprint cards, please click here.